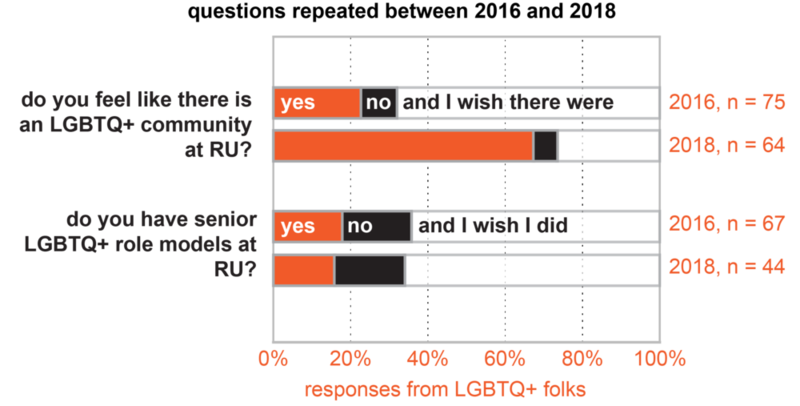 As with our 2016 survey, people at Rockefeller identify across the LGBTQ+ spectrum, with 68 out of our 104 respondents self-reporting as not straight and/or not cis. These LGBTQ+ people are present at all levels at Rockefeller, from administration to laboratory staff to scientific trainees, with one continued exception: no LGBTQ+ head of lab (HOL) was found in our survey. This lack of representation at the highest level of science fits in with other “leaky pipeline” data found about sexual/gender minorities in science, and points to the need to intentionally retain LGBTQ+ scientists, particularly at the faculty hiring level. 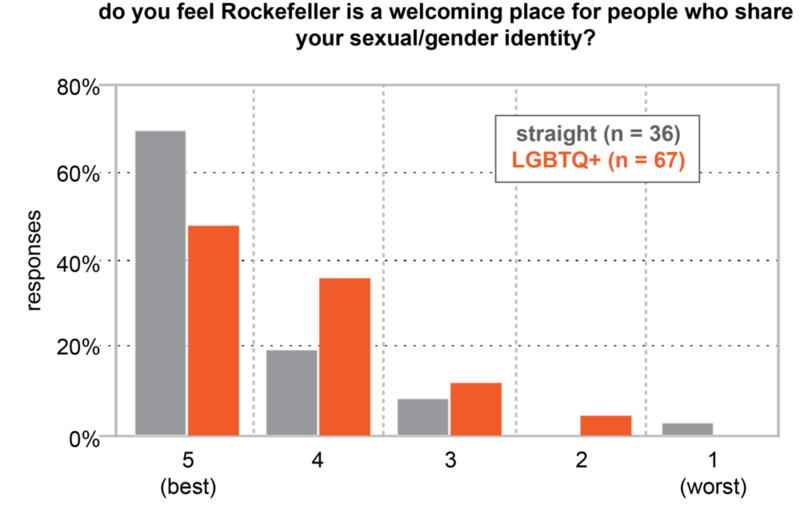 Comparing our demographic data from 2016 and 2018, we found that respondents identifying as trans/nonbinary/other respondents increased from 4/191 (2.1%) to 6/104 (5.8%). Though our respondent pool is small and non-random, we find it encouraging that there are people of trans experience at Rockefeller who are interested in PRISM. One of our goals for the upcoming year is to increase our resources on trans issues, such as collecting information on how to navigate medical transition within Rockefeller insurance plans. We also collected data on racial demographics for the first time this year and found that 22/68 (32.3%) of our LGBTQ+ respondents identified as something other than white -- a large contingent of queer people of color on campus. The most striking difference between the responses of 2016 and 2018 was the huge jump in the percentage of respondents who feel like there is an LGBTQ+ community at Rockefeller, from 22.7% to 67.2%. A few of the free-form comments said that the formation of PRISM contributed to this rise, which has us feeling proud. However, this sense of community was unevenly felt: many people wrote in the free-form comments that since so many PRISM events are science-focused, they as employees in administration or other non-scientific fields did not feel like the events were targeted towards them. Our board is now composed of both staff and trainees, and we plan to include more social events, in addition to keeping our science-related breakfasts and panels, to make PRISM an organization that feels welcoming to the entire Rockefeller community. In contrast to the marked change in peer community, the number of people who have senior LGBTQ+ role models at RU has stayed almost exactly the same. This points to, again, the leaky pipeline problem in science, as well as the multifaceted nature of acceptance of LGBTQ+ people. We coarsely measured the climate of Rockefeller by asking people to numerically rate how welcomed they felt here (5 best, 1 worst), and found that overall, LGBTQ+ people feel very welcome at Rockefeller (4.7), though non-LGBTQ+ people felt slightly more welcome (4.9). Because climate for LGBTQ+ people is so linked with gender and race, we hope to collaborate with WISeR and RiSi to more finely measure climate on campus, particularly incidents of harassment and discrimination. PRISM recently underwent its first leadership transition, with four new board members joining and two from the founding board departing. With this new energy, we were particularly interested in surveying what new activities our community wanted. As per PRISM survey responses, we are already planning smaller social events and networking events that span multiple NYC institutions. We have held a small mixer in collaboration with a new LGBTQ+ group at Mt Sinai. We are especially excited to march in NYC Pride on June 24, representing oSTEM in NYC (please sign up!). We’re very happy to continue working to create community and professional opportunities for LGBTQ+ people at Rockefeller. Thanks for sticking with us for two years -- the next two will be even better!